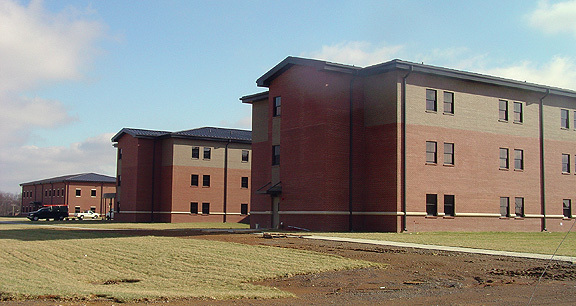 Project obstacles and solutions: The 19th Engineer Battalion is located inside the U.S. Army base at Fort Knox, KY. B.L. Harbert was awarded the task of designing and building a new headquarters for the battalion. The design consists of five main structures encompassing 200,000 square feet. This includes a three-story barracks complex, a two-story headquarters, an administration building and two company operations buildings. This all sits on a 30-acre site surrounded by concrete hardstand. B.L. Harbert constructed the piers, footers and elevator shafts for the project. Sam Taylor followed with over 4,000 cubic yards of concrete for the building slabs. The upper decks of the buildings were poured with 1,500 yards of lightweight concrete. IMI QC/QA worked with both B.L. Harbert and Sam Taylor to make sure that engineering specifications were met and concrete was consistent from one load to the other. Beyond the buildings, this project had special paving considerations for the driveways, parking lots and sidewalks. Since the base is a training facility, utilizing all kinds of heavy military equipment, special consideration had to be made for all of the hardstand areas across the 30-acre site. Bluegrass Contracting had the task of placing 6,000 cubic yards of concrete paving in the hardstand areas, as well as drivable sidewalks. Some of the concrete paving has a depth of 10" to accommodate driving lanes for the battalion's track vehicles and equipment. IMI provided fiber reinforced concrete for all of the concrete paving areas to help with surface strength for the heavy rolling equipment. Bluegrass poured all of this over an asphalt drainage base. This project will be complete in the spring of 2014. When completed, the project will use 15,000 yards of concrete.